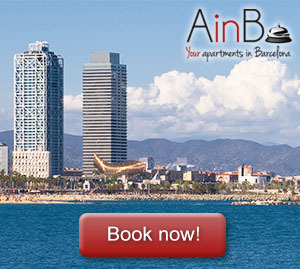 In this category we collect the best apartments rent for days in Barcelona and neighborhoods where to find them, to hit on your choice when you plan your trip to Barcelona. We all know famous neighbourhoods in Barcelona: Gothic Quarter with Barcelona’s Cathedral and Sant Jaume square; El Raval and its Rambla with Botero’s cat; Eixample with its beautiful modernistic buildings; Gràcia with its unique charm… but there are many more areas that are not so known, and they have much to offer. One of this relatively unknown neighbourhoods is Sants. This area is located in the west side of the city and there we find the main train station of Barcelona: Barcelona Sants. So, many people arrive in Barcelona and Sants is the first neighbourhood they visit without knowing it. Christmas is, indeed, an especial time of the year. Streets are decorated with beautiful lights and crèches, houses are also decorated with Christmas trees, mistletoe and holly; and despite the cold weather, you can notice some magic touch in the environment. There are plenty of different cultures and traditions all around the world, and Christmas celebrations are not an exception. This way, we can find varied Christmas traditions depending on the geographical area we analyze. Sagrada Familia is probably one of the most famous buildings not only in Barcelona, but also in the world. Designed by Antonio Gaudí, this huge basilica is still under construction and it’s expected to be finished in 2026: the centenary of Gaudi’s death. Every year, this monument is visited by more than 4 million tourists and, probably, most of them are so excited with Sagrada Familia and forget that around this temple there’s a wonderful neighbourhood to discover. We’re talking about Sagrada Familia neighbourhood. In this post, we’ll talk about beautiful places you can discover while you stroll around Sagrada Familia. Barceloneta is Barcelona’s traditional maritime neighborhood par excellence. Nowadays, it combines traditional houses and some of the most modern buildings of the city. One of its major attractions are its big and beaches: Barceloneta, Somorrostro, Sant Sebastià and Sant Miquel. All those are easily reachable from this chic bohemian apartment in El Born. Barcelona is one of the most visited cities in the world. In fact, over 4 million tourists visited this astonishing place last summer and all the hotels were at full capacity during the months of June, July and August. Now you’re probably wondering how could you spend your summer holidays in Barcelona if it’s impossible to find available hotel rooms in the city center. Well, some good news are coming: You can book a nice Bed & Breakfast in Via Laietana, right in the city center and even cheaper than a hotel!